These were a super cool design, the little alcoves with windows were seats. Fiberglass with plexiglass windows. Circa late 70s, most were retired early to mid 80s. 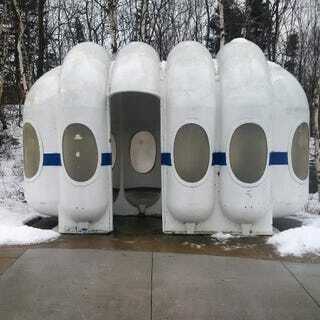 While they look space age, and are practically indestructible, in practice people just peed in them, and the bus driver couldn’t really see if anyone was waiting. One survives at the Halifax Transit bus depot. H/t, Image, Ann, via Halifax ReTales, original tweet below.